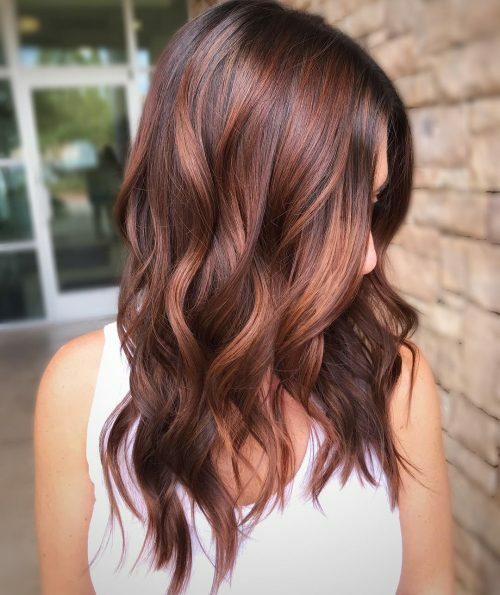 A red balayage is a hair color that involves a freehand painting technique to dye the hair with red hues to create highlights or ombres. It’s every fiery girl’s dream come true! 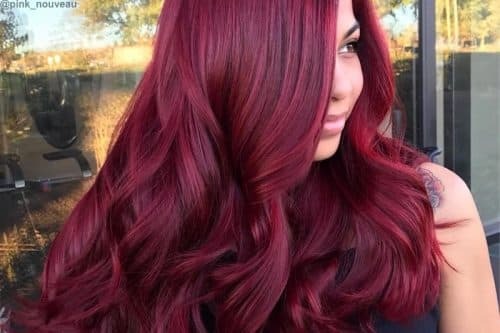 If you’re craving for a sizzling change to liven up your look yet do not want to commit to the maintenance that red hair normally requires, it’s time to celebrate because the answer to your wish is here! California hair painter Constance Robbins is known for making sweet waves even sweeter with this popular dye job! With the various vivid shades of red – cherry, wine, copper, and auburn – you might be confused at first which hue to try. Here are a few tips to consider! Warm red shades pair best with yellow undertoned complexions, while cool toned skins match more of the darker reds. 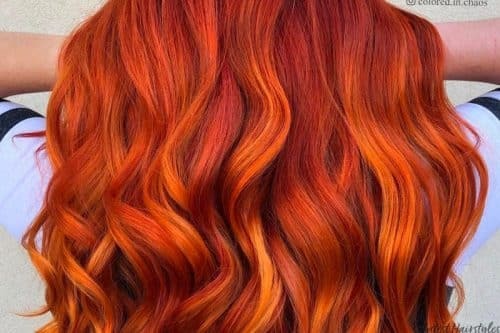 Using color-safe shampoos is still a must to keep the vibrancy flaming and the color fresh. This sweet blend is certain to fire up your look and inject a dose of brightness and dimension to your mane! Let your strands shimmer with flashes of ruby hues when you try one of these gorgeous red balayage hair colors! Muted red on black hair leaves a powerful feeling. Plum tones can also be seen swept over hair so lightly. A dash of sweetener on rich red hair. This monochrome ombre works by creating a distinction of both colors. Good thing the balayage happened because what other way to posh up a brunette than smooth scarlet streaks? Plum for fun! 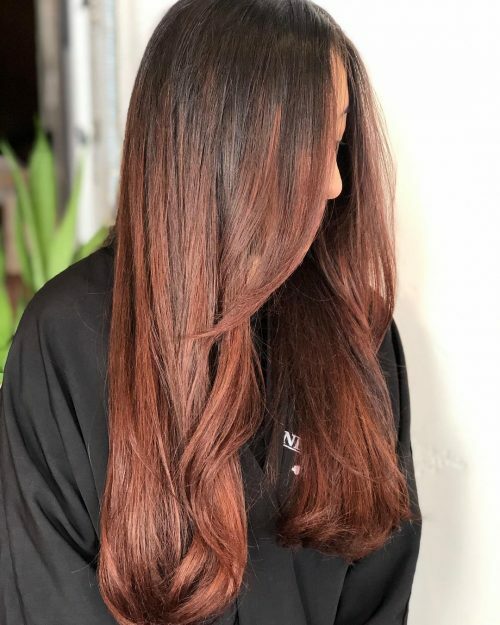 Colorist Ellie worked on this masterpiece by sweeping rich red dye onto long locks that resulted in a gorgeous balayage. Do I sense Ginny Weasley in these ginger locks? 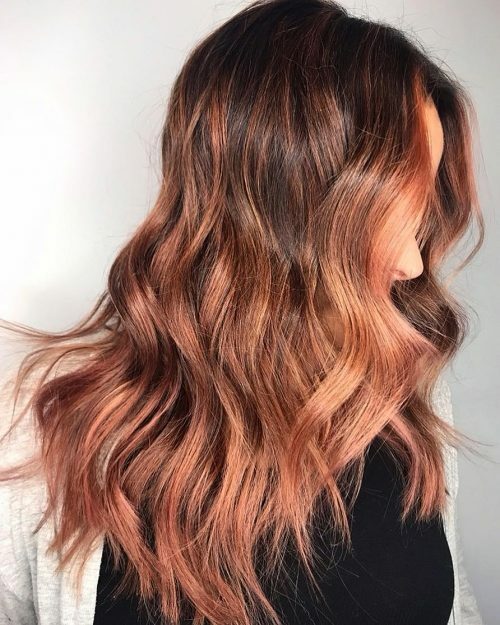 Ask for a rich rose gold color that would be swept down your locks. and you’ll find your own Harry in no time. 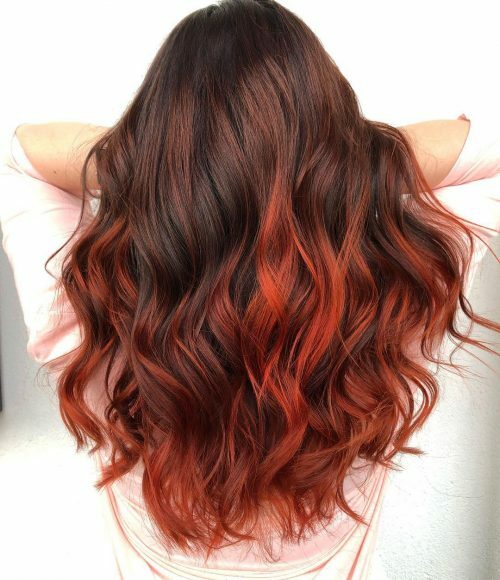 Crunch in those autumn colors in one mane as wearing a burnt sienna fade goes well in any season. 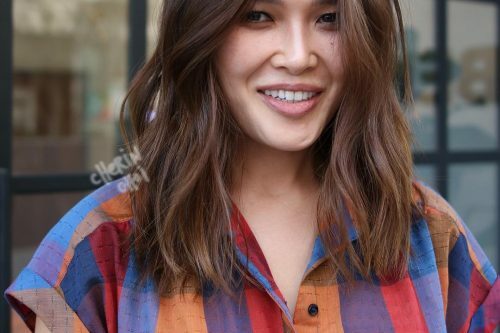 Brown to red balayage hair colors are perfect fall shades. Anyone who has naturally dark brown hair, take note. 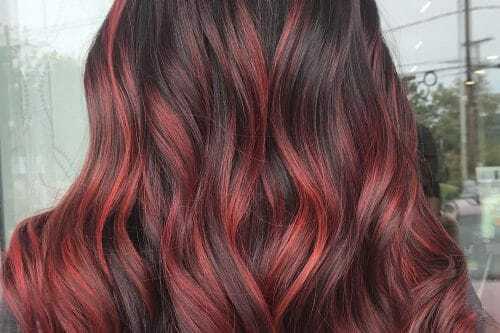 This is the ultimate crimson balayage look. Stylist Allie made a spicy fiery look so soft and flattering! 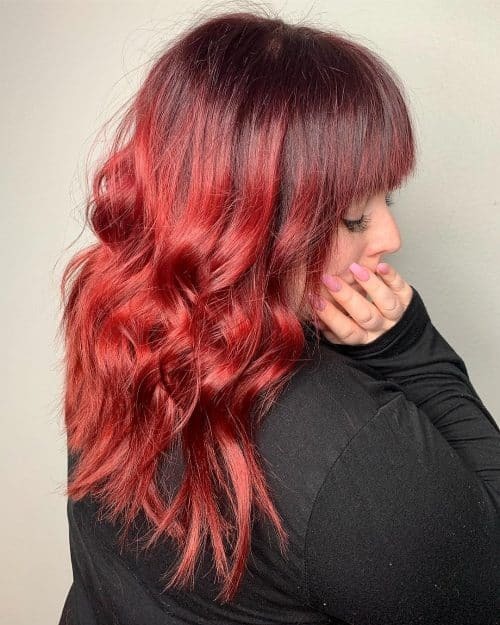 Red and black screams burning passion and we’re passionate for that hair color by colorist Ashlee! 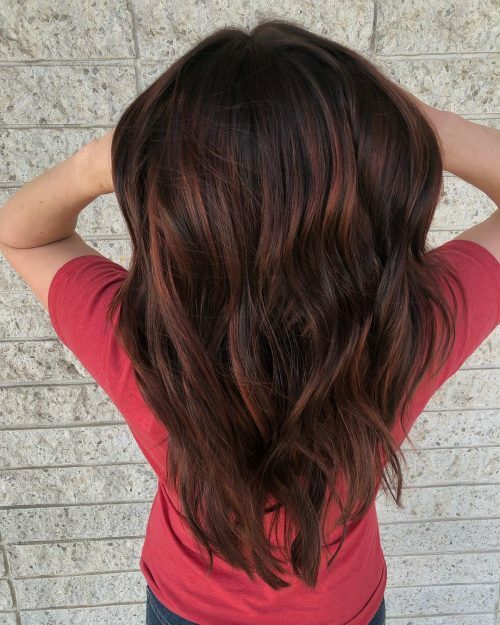 She does a phenomenal job with red balayage hair color on her client here. I love how the bright pieces play with the layers of the haircut. The rich copper tones within the root shadow balance beautifully with the sun-kissed blond, creating shine and contrast. The beach wave styling is effortless but still polished and sophisticated. The styling gives the look movement while accenting the balayage highlights. 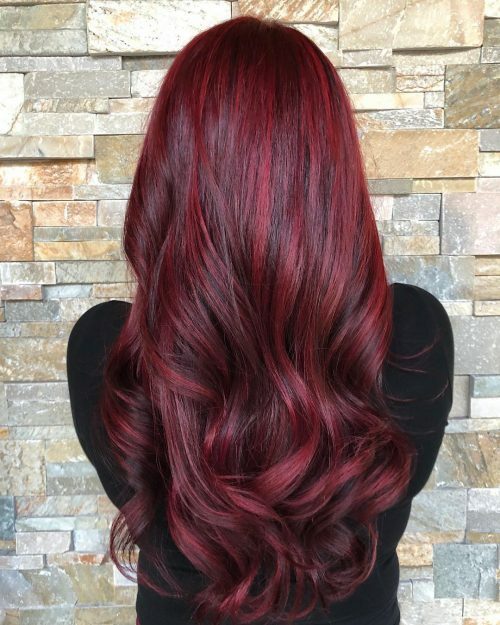 This red balayage hair color is perfect for a woman on the go who doesn’t want high maintenance hair. Someone who wants to see more dimension and brightness through her mids and ends. I can paint these accent pieces to complement any face shape! Multidimensional tones are great for all skin types and easily customizable to fit most clients needs and wants. 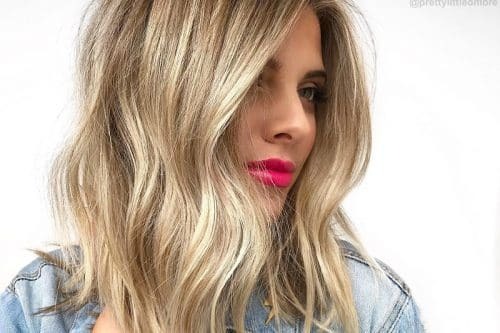 They will naturally grow out beautifully and last 8-12 weeks, so only the base color needs to be refreshed and a gloss on the ends. Red tones tend to fade easily so home care is crucial! Kerastase Chromatique Shampoo and Conditioner will keep it healthy and secure the color in between visits. The styling gives this look its oomph and product is the key. Kevin Murphy’s Bedroom texture spray is perfect to give her the tousled beach wave finish we are going for. She should be comfortable loosely curling her hair to get the right effect on those beach waves. 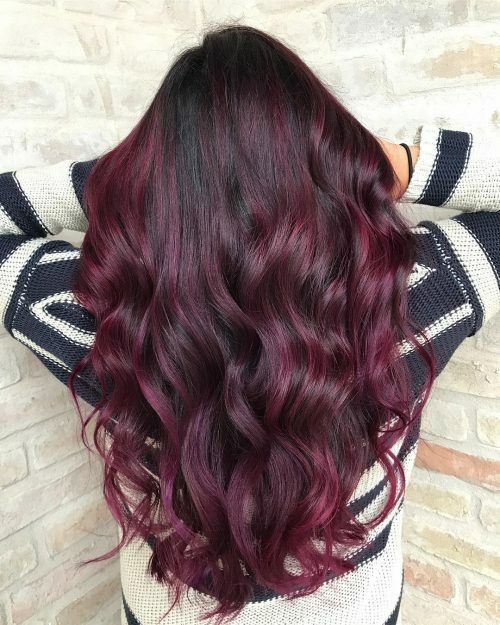 This look is a “cool burgundy balayage”. I love that you don’t have to use bleach to get this look if you have virgin hair! 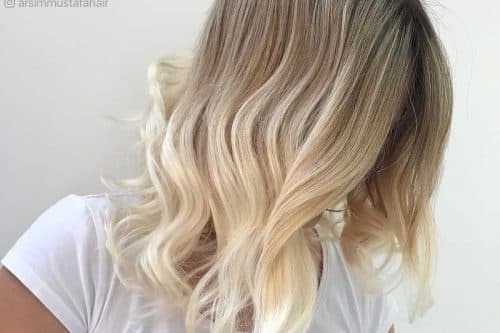 If you already have a pre-existing balayage, you could just throw a semi-permanent color over it. 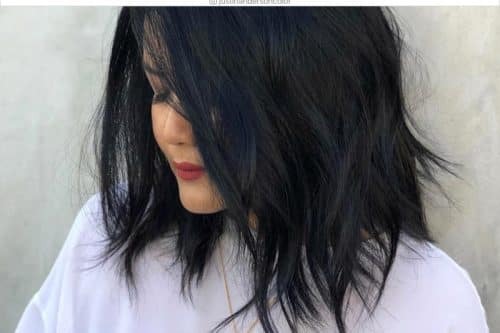 I think it’s great for someone who wants to add a fun color to their look without going too crazy with the cut! Also, someone who is looking to do something funky with color without having to go through too much damage to their hair. If you are considering this look, just know that it may fade somewhat quickly since it is in the red/violet family. A good trick when washing would be to use cooler water, it helps with fading. Definitely, use a color protecting shampoo and conditioner! Even a color depositing shampoo/conditioner with greatly help prolong the color. If you are wanting to maintain the color, it’s a good idea to come back about every 4-6 weeks to have it refreshed. I think this color looks great on many skin tones, especially olive! It’s very versatile in terms of styling, looks great straight, curly, even in braids! A good serum that has heat protection helps bring out the shine, closing the cuticle hence keeping the color more vibrant. This is a bold, fun look for someone who likes to get noticed! I find keeping my colors, even fashion colors, more rooty allows for better grow out & looks great longer. Almost anyone can wear this shade of red, however, it is a battle to keep the vibrancy. Professional grade shampoo is a must! Also, the client will need to come in to refresh the color monthly. The great thing about lifting the hair to a level 9-10 first is it lays the groundwork for many other colors after. This client has been bright purple & now we’re pursuing a blonde look. This look is being a chic redhead with a boost of copper and pops of gold. Our favorite thing at TwoDo is to have a fun model with great hair to work with. This hairstyle was a team effort since Olga did the cut and I did the color and blowout. I love the way her hair is framed with layers around her face which adds dimension and makes the color pop. For her hair color, I used Calura by Oligo and added drops of Goldwell pure pigments in red and gold. 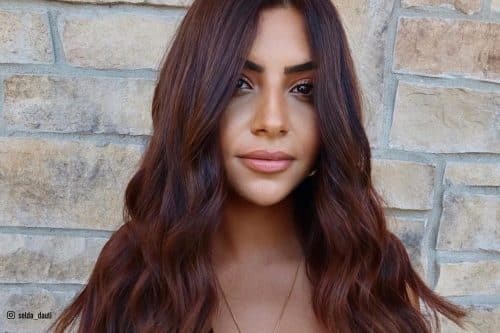 For the blowout, I protected her hair from the heat with Kerastase Ciment Thermique and I used a large round brush to achieve a bouncy, silky look. 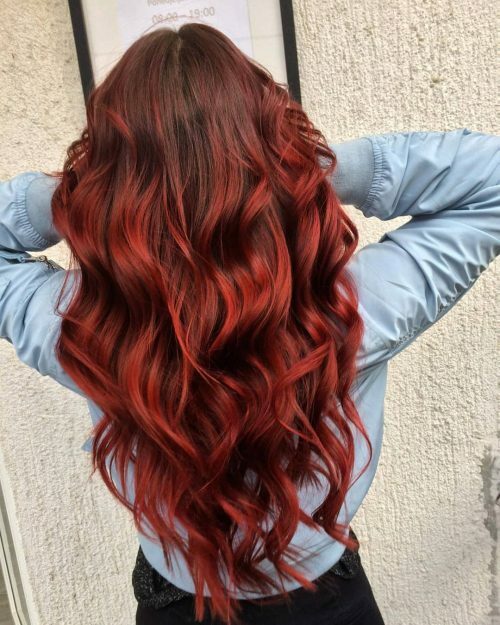 As a vibrant redhead, your color will always be your best accessory, but we always remind our clients that maintenance is important both in the salon and at home. To keep this hair looking amazing, we recommend coming in every 5 to 8 weeks for color refreshing. 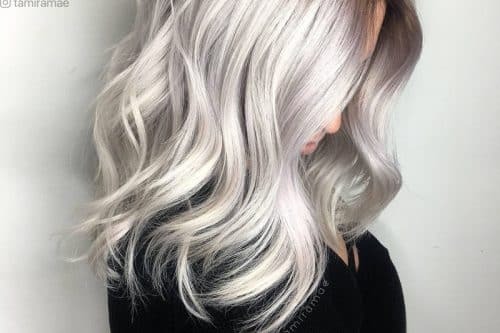 We would advise anyone with this hair color and style to invest in quality hair products and always use a sulfate free shampoo for color treated hair. We recommend Oribe’s Beautiful Color Shampoo and Beautiful Color Conditioner because it’s gentle, luxurious, and it really works to preserve the color. This red velvet color melt is actually 4 different reds from darkest to lightest. The application was performed into two different sessions, avoiding blonde staining. The red was applied on damp hair for easy saturation and melt technique. It’s best if you are a blonde. The blonde is actually the most difficult, lifting the hair to the desired level then applying the red. Remember red and blonde shades require more maintenance. You must use a professional shampoo and refresh your color every 4-6 weeks as fading occurs. 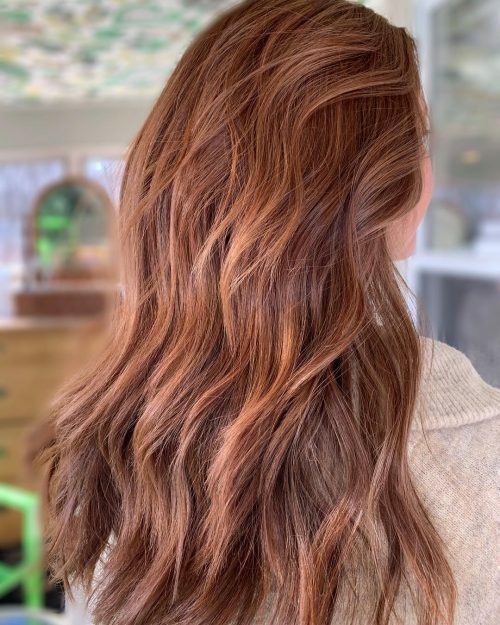 The way I would describe this look is just very natural and embracing her natural red tones, but giving it an extra pop of color with the balayage. 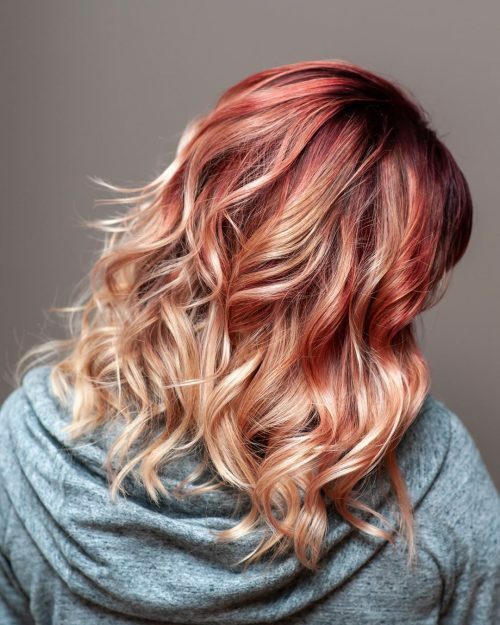 This type of balayage is great for someone who may already have red or auburn tones in their hair, but they want to add a little dimension, but not too much to take away from the red. 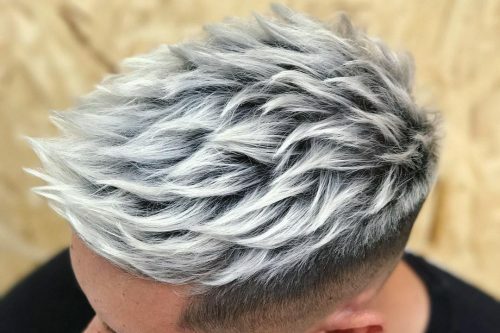 This style looks best on someone who has medium/thick hair. 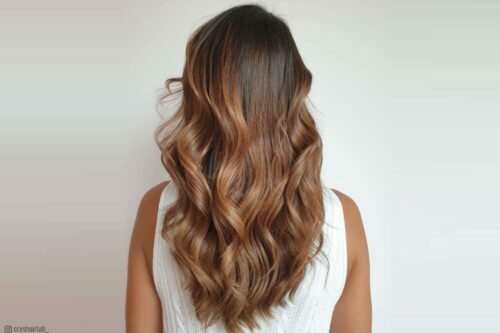 This type of balayage can last someone three to four months, with the maintenance of just a glaze or toner every 6-8 weeks. The blown out beach waves are my favorite. They really are effortless and can last a few days. For the best hair length, I would say shoulder length or longer. You can never go wrong with a good dry texture spray to give that beachy lived-in look. 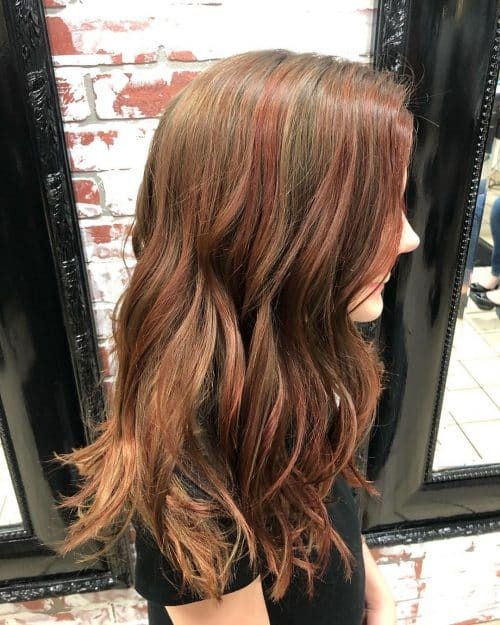 This is a red balayage hair color in combination with teasy lights to give it a softer look and help break through the box color she previously had on her hair. I love how this shade of red still looks natural so it could work if a client just wants a subtle change! This look is 100% customizable. If you’re nervous about doing it, start off with small and subtle teasy lights, then go bolder with more! The color red can be overwhelming to some people but take it slow and you will love it! This look is a multi-tonal, auburn/copper color melt. 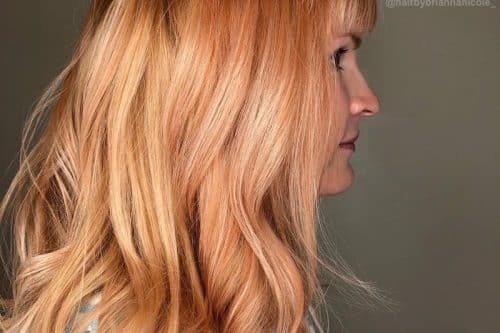 To achieve this look we did a subtle root smudge with a warmer color than her natural (4nw), followed by painting from the rooted area through the midsections in some areas and through ends in others (5c+5cb and 7c) to create depth and dimension. For the ends and up into some of the midsections I used a lighter copper (8c) to complete her multi-tonal color melt. To showcase the amount of color variety we chose to do a soft, “beachy” curl. To prep her hair we used a texturizer spray that has heat protection in it. This way we have some hold, color protection, and a little extra grit. Post curl we applied another layer of the same spray for hold and volume. Her longer layers give the perfect amount of movement and lift to her style without looking blunt or choppy. High elevation and a steep angle will give soft layers to preserve the weight toward the ends to keep it as thick as possible while being able to have a lot of layering. This keeps volume and “bounce” for beachy curls. I would recommend evaluating how much time and energy you have to invest in maintaining a warmer look. While technology in modern hair color has come a long way, any reds or coppers tend to lose vibrancy fairly fast. Make sure you are willing to use high-quality color care products at home to prolong your preferred color. 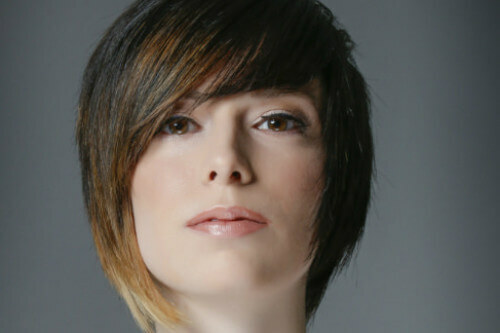 Ask your stylist if your goal hair color is appropriate for your skin tone and eye color. There are (luckily) expansive choices when it comes to warm colors – so do your research and make sure you feel comfortable with your color technician. 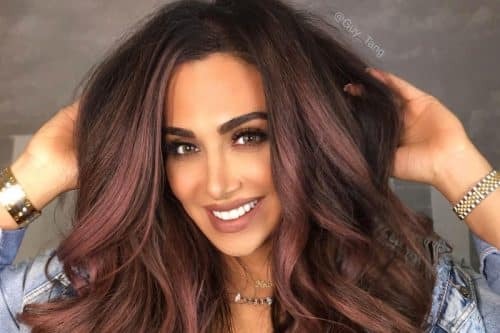 If you don’t like to visit the salon often, perhaps settle on a copper or golden tone that has a longer lifespan than some of the reds that tend to fade after 4 weeks. Consider that the canvas you are applying color over matters as well. 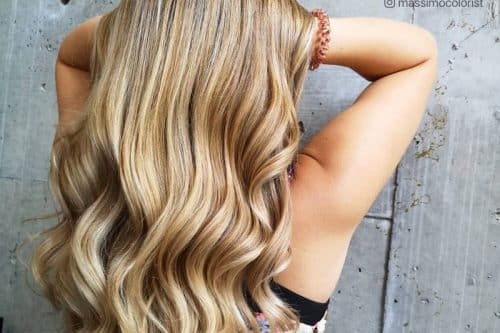 Do you have lighter or more ash toned hair? It will most likely fade faster than applying over hair that has a deeper pigment or warmer underlying tone. Redheads are fun and have a feisty vibe, whether it’s natural or not. I’d say go for the colors that are right for you as an individual and have fun with it! Just make sure you use protection (UV protection, heat protection, color safe shampoo/conditioner, red/copper enhancing conditioner, etc.)! This look is a playful real-life Little Mermaid hair! This vivid color is bright and cheery and head turning. My favorite thing about this color is that it has depth, richness, and brightness all in one! I added depth using rich natural tones at her base and lightened strands so that when I added Joico color Intensity for her overall red she would have a variety of tones. As far as the cut, we kept her length and added long layers to maintain fullness, yet have some movement. They should definitely be a fan of red hair! 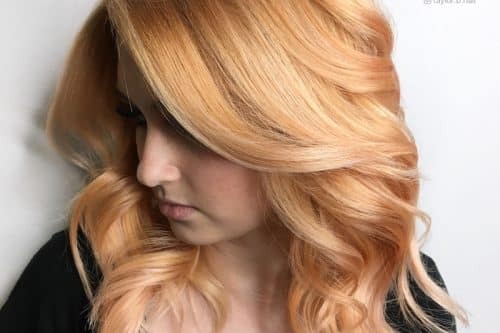 I am most comfortable doing this on clients who have had some tone of red hair in the past so that they themselves are comfortable with these tones. This would be recommended for someone with fair skin and or deep features, eyes/eyebrows, because of the depth in this color. They should be ready to wow people with the brightness and also ready to commit to the maintenance. My clients with fashion or vivid tones can’t wash more than 2-3 times a week, purchase color safe and color extending shampoos, and are fans of dry shampoos! 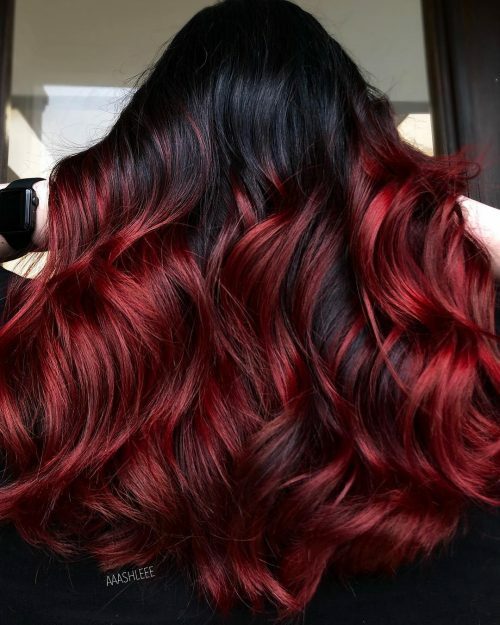 What I love about this color is how the brighter red flows into the depth of the mahogany waves of her hair. My lovely client has naturally wavy textured hair and wanted to see more vibrant red in her already colored, deep mahogany hair. So I wanted to create bold red pieces to complement her waves and contrast the darker red. 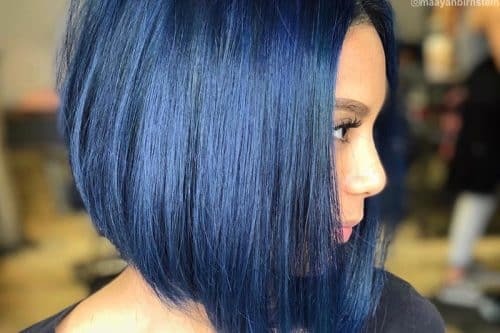 Colors that flow like this go well with a haircut that gives body so I gave her medium length layers and lots of texture. Reds should always be vibrant! Red pigments in hair color usually fade fast and become dull if you don’t keep up with maintenance. That means using color-safe, professional shampoo, conditioner, & styling products. Depending on what products you use and how often you’re washing your hair determines how long the vibrancy in your hair will last. I generally recommend refreshing it with your stylist every 6-8 weeks. 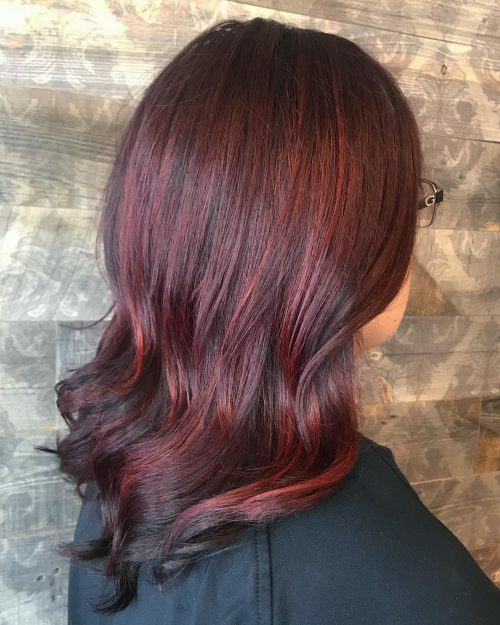 My client does work in a non-creative industry, so this color allows her to have fun, vibrant red, while not being too overwhelming. This vibrant red is a multi-purpose red. 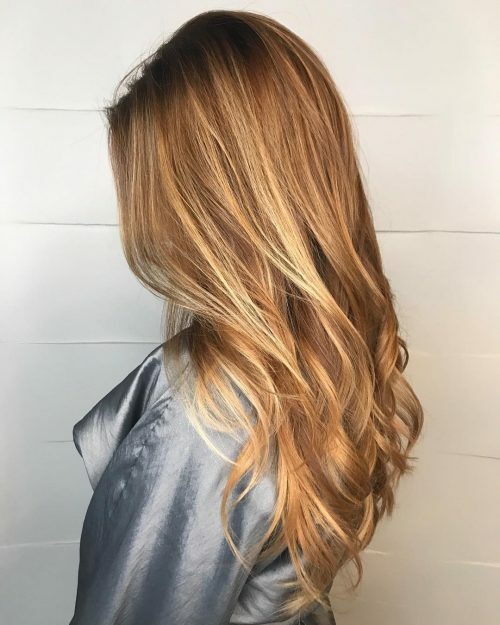 I did a blonde balayage for this client some months ago and now she wanted something bolder. I kept her roots natural and used different reds depending on where the light was to create more dimension. I love how she can put her hair up and back to keep it more natural and when she wants to show it off she can let it all down. I think waves help create the dimensions and intensity to the color. I would keep in mind that it can be a high maintenance color. You would need to touch up every now and then. I always recommend my clients to use a good color preserve shampoo and conditioner. Too hot styling tools will make the color fade faster. And last but not least, if you are considering it, go for it! Colors are fun.